Are you looking for a "Horrible" time in London ? Written by a "born and bred" Londoner, Horrible London will help you discover 40 ghastly horror related places in the capital. + Go on the hunt for London's worst (or is that best?) killers and visit chilling murder scenes. + Get the fright of your life in London's best scare attractions. + Find London's creepiest and weirdest museums. + Discover the shocking past behind some of London's most famous landmarks. + Explore London's former execution sites and learn about their gory past. + Find hidden graves underneath the Strand. 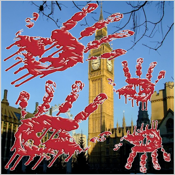 Download this app if you dare and start exploring Horrible London today ! My name is Martin and I am an independent iPhone developer living in London. I am also the "born and bred" Londoner mentioned above ! I have a passion for London's unusual places. I really hope you enjoy the app and drop me a line using the in app feedback ! England's capital is truly one of the world's most magnificent cities. Its history spans two millennia which means the city is flowing with historical sites and deeply rooted cultural treasures.